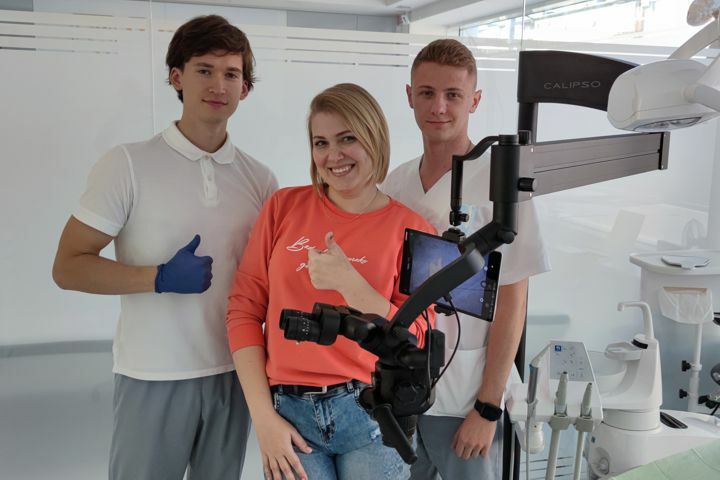 Design department is engaged in the development and construction of units and design of «Scaner» medical devices, which consists of more than 1000 original items. Qualified engineers develop mechanics of nodes, optical calculation, they design electric circuits and other components of our products. 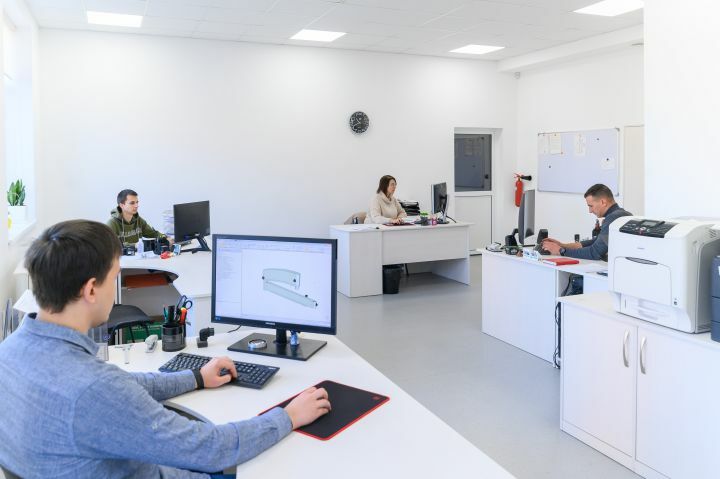 Construction of parts is made in 3D with the help of professional CAD modeling system, which helps to prevent any probable inaccuracies on the development stage, making the process efficient and allows to create a unique, ergonomic and user-friendly design of the equipment. Manufacture of parts by means of modern high-precision turning and milling machining centers is maintained by highly qualified specialists. Control of the accuracy of manufacturing is carried out by certified measuring instruments. Locksmith services: bending, production of threaded holes, trimming of parts, etc. Production of parts in modern metal-working centers. Computer cutting of sheet metal by laser beam. Painting shop. Application of anticorrosion coatings on the details: anodizing, chemical oxidation, decorative enamel powder coating. The enamel is applied to the details and polymerized in an oven at a temperature of + 200C. The polymer composition of the paint used in our production, provides uniform coverage of details and resistance to chemical solvents and mechanical damage. Assembly of devices and their units out of the prepared components. Each unit after assembly goes through thorough adjustment. With special stands and devices assembly and alignment of optical systems of our equipment are fullfiled. In addition, final control of finished devices and testing of new advanced optical designs are held here. 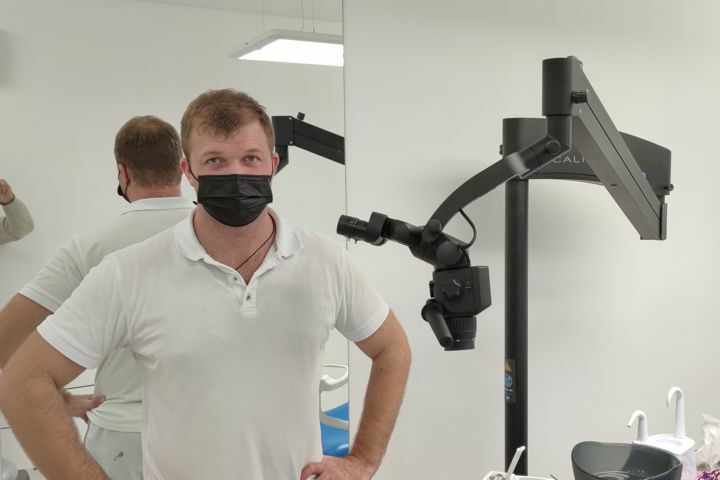 Dark room with a vestibule and an autonomous system microparticle and dust extraction, where all optical parts are thoroughly cleaned with special solutions. Cleaning is carried out manually. Quality of our product is controlled at all stages of the life cycle: from the collection of information, formulation of technical tasks and design development, to packaging and servicing of finished medical equipment. 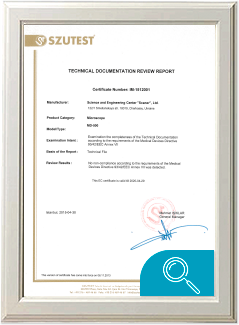 Qualification of our staff and experience on the instrument-making enterprises allow them to control the accuracy and quality of their work by themselves. 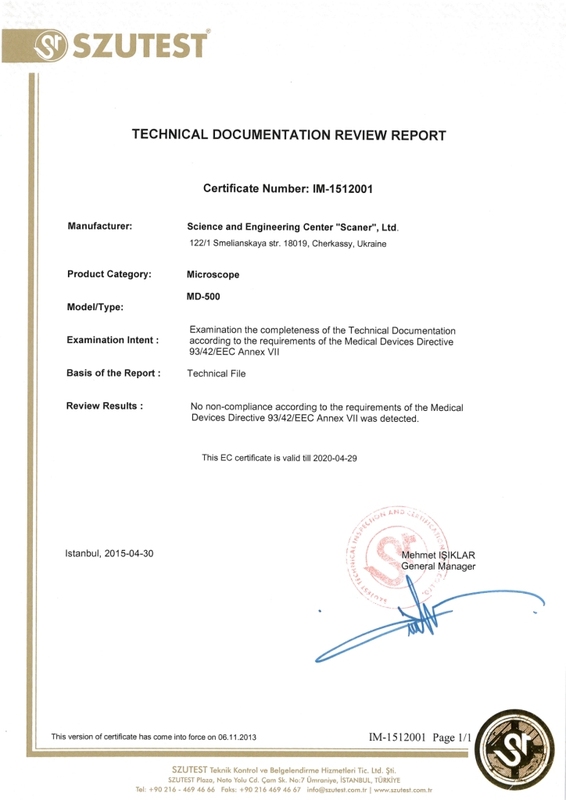 Devices go through acceptance tests and regular periodic tests that confirm their compliance with the standards, specifications and regulations on medical devices. For the packaging of medical devices we use special foamed polyethylene, which fixes the product in the transport package and protects it from possible damage during transportation. The completeness of each package before sending is recorded and documented photographically. That is why, any package errors are excluded. Warehouse. Ready-packaged products are stored in a special room with controlled environmental conditions. Installed in warehouse thermohygrometers allow us to control the temperature and the required humidity. Delivery of medical equipment is possible by sending or by our transport. Our experts install the equipment in hospitals, including the installation of the software or consultation by the phone. 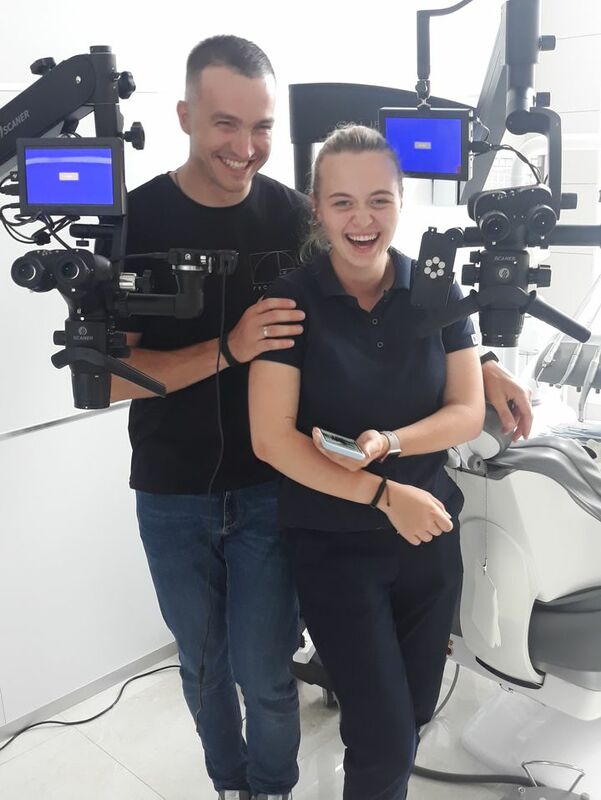 We have training programs and master classes concerning the usage and operation of the equipment, which take place both within our company and out of it. 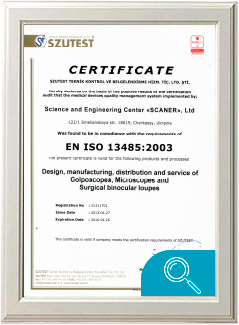 Certifications ISO 13485 - an international standard that contains the requirements for an integrated quality management system in the enterprise, engaged in the production of medical devices. 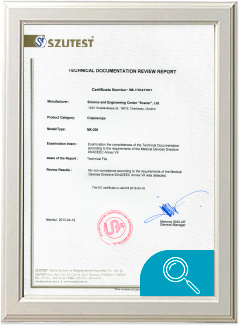 Implants into the quality management system requirements established for medical devices at all stages of the life cycle, begining from design, manufacturing, distribution, to technical support and service. 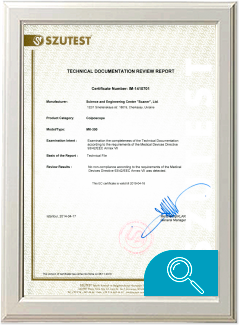 CE marking - a special mark, which certifies the compliance of products with the requirements of directives and harmonized standards of the European Union, confirms that such products have passed the conformity assessment procedure. 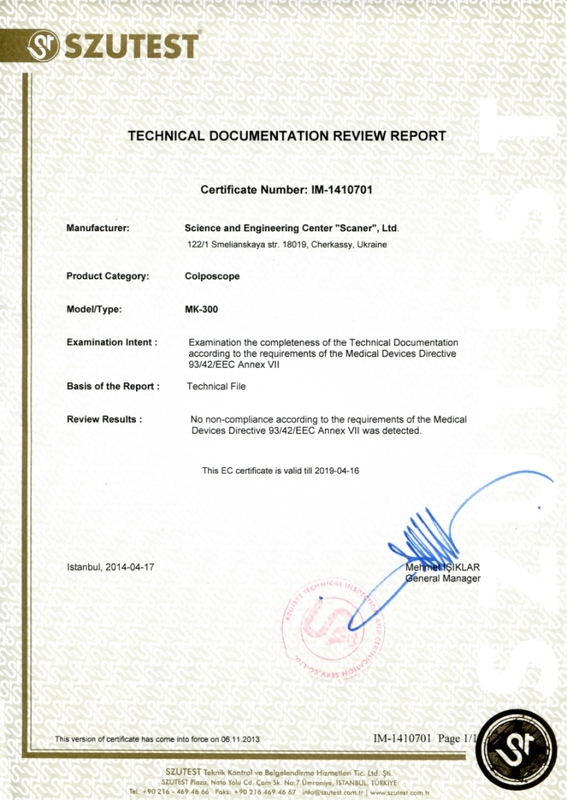 The only official marking on the territory of the EU, confirming the compliance of products with European standards for human safety, property and the environment. 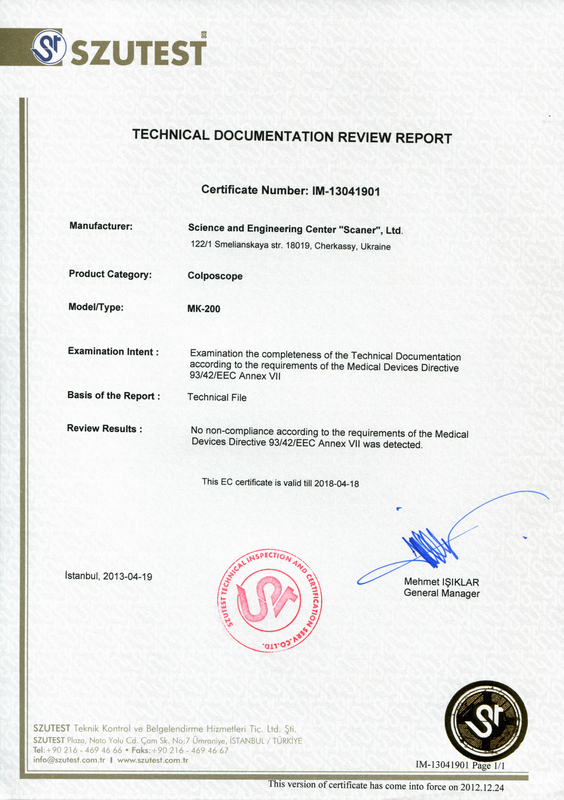 Microscope «CALIPSO» and colposcopes «Scaner MK-200» and «Scaner MK-300" are marked with the CE, conformity assessment passed, with the involvement of a notified body, and have certificates.